Rituals and routines provide children with security and a sense of safety. Their understanding of what comes next allows them to prepare for each day. We follow the same basic daily routine, with adjustments to accent our area of study. 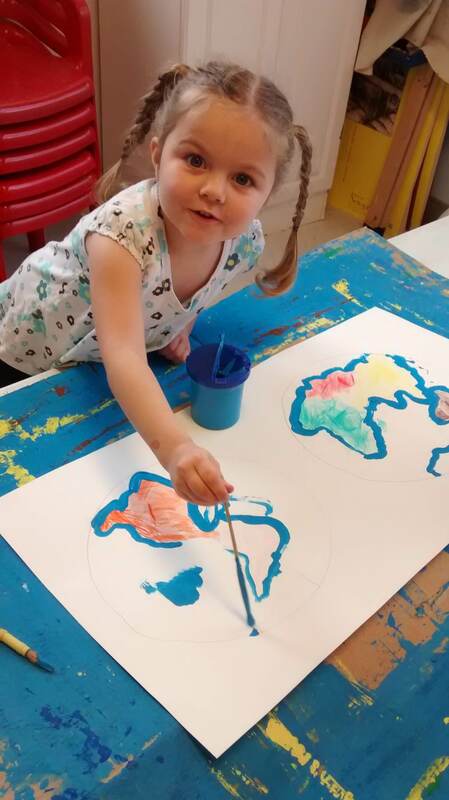 Students are guided through the Cosmic Curriculum (developing a child’s awareness of a larger community) with an emphasis on developing the Independent Child, where children are encouraged to explore, grow and develop at their own pace. The children work freely, alongside – and with – each other, while teachers work one-on-one, or with small groups, introducing students to new materials and new concepts as they each become ready. Once introduced to a skill, the activity is accessible for the child to self-select later and then repeat the lesson for skill mastery. Some pieces of the Montessori equipment isolate one skill and focus on it, yet other pieces may be educating the child in multiple ways. Many of the materials are self-correcting, which promotes independence, and problem solving. 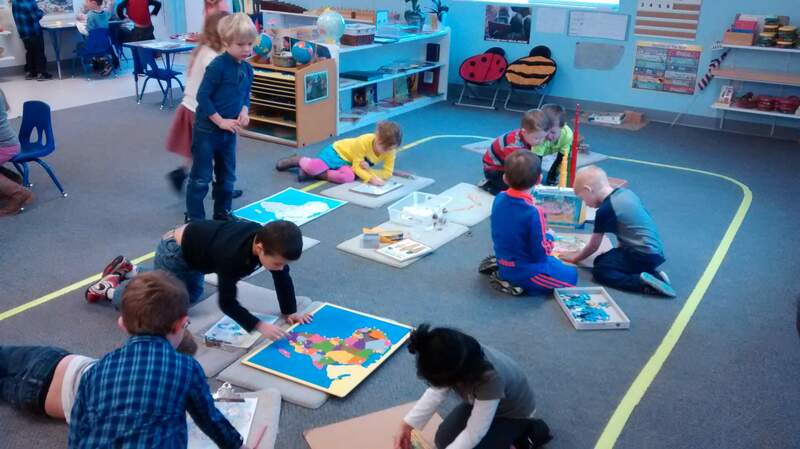 The Montessori materials build upon one another, making the progression important. Many pieces of work generate no paperwork so children are busy working throughout the day, but may not have take-home papers to illustrate their achievements. 7:00 a.m. (Five Mile opens at 7:30 a.m.) – School opens for drop-offs. 8:40 a.m. – Group line time. Roll is taken, weather charted, and the calendar days are tracked. The “Pledge of Allegiance” is recited along with a flag song. Subject matter from the Cosmic Curriculum is covered, new activities are demonstrated and important announcements are made. 9:15 a.m. – Teachers working with the children individually or in small groups. Work may be mandated for some children while others may be selecting a “free choice” activity that reiterates previously covered areas of learning. The kitchen is set with art activities for students to select. Morning snack is served to small groups of children rotating through at a designated table. Each day, school provides either a morning or afternoon snack. Children are offered the opportunity to bring in and share a healthy snack of their choosing for one of the snack times. See the school bulletin board for details. 10: 45 a.m. – Group line time for singing and daily responsibilities. Each child has a classroom responsibility such as sweeping, dusting, straightening a shelf, etc. These responsibilities are rotated each month. 11:00 a.m. – Morning recess outside on the playground. 11:40 a.m. – Group line time for singing, creative movement, and storytelling. Getting ready for lunch by washing hands and getting lunch boxes. 12:15 p.m. – Lunch. Children bring in their own lunches, food that needs warmed in a microwave is an option as the teachers will warm food for students. 1:00 p.m. – Group line time for various activities and usually a story time. 1:20 p.m. – Younger children are dismissed for nap time. Kindergartener work time begins. 2:00 p.m. – Children awake in the nap room are able to get up for the 2:00 work time. 2:45 p.m. – All nappers are woken to participate in class. 3:00 p.m. – Group line time for afternoon snack and story time. See the bulletin board for children to voluntarily bring in a snack to share. 3:15 p.m. – Afternoon recess outside on the playground. 4:15 -5:00 p.m. (dependent upon season & weather) – Group line time for singing, stories, etc. Everyone washes hands and are allowed a free choice activity. The “after school closet” is opened and the children can self-select board games, legos, train sets, colorings, and other elective games while they wait for pick-up. 6:00 p.m. – School closes. 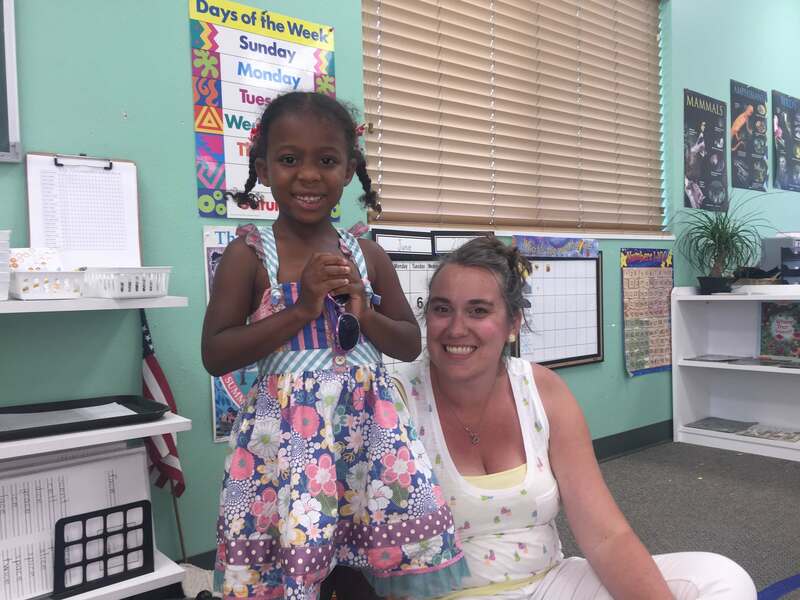 Spanish Class – A once a week class in both classrooms that is taught by Lead Teacher Anna Isaacson focusing on colors, counting, songs and games. Spanish class is included in the tuition. Music Class – A once a week class taught by musicians and using the Kindermusik program. This is an extracurricular class that is not included with tuition. Registration information is provided at the beginning of the school year.